We strive for excellence in our design files from the very beginning, but at times older designs and fonts need attention after release. Sometimes it's to add new sizes or additional files (like numbers and punctuation), sometimes it's to fix a small error, other times we want to bring older designs (digitized in different software) up to our current standards and completely start over from scratch. Whatever the reason, we announce the updates in our newsletter, on our Facebook Page and in our Facebook Group. In case you miss one of those announcements, we will keep a comprehensive list here in chronological order. The smallest size is now 1.5" instead of 1.75". The letters were thickened up a bit. 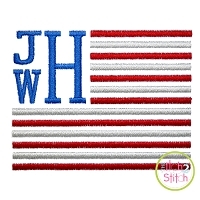 The satin/satin fill setting on the larger sizes were adjusted: the 4.5" size is completely satin stitch, and the 5.5" and larger sizes have a consistent split satin fill through most of the letter. The right letters of Fancy Circle were completely redrawn! The original artwork for this font consistently has the right letters smaller than the left. Because that caused some letter placement issues, we shortened tails and increased the size of the body of the letter to better match its left counterpart.